The Creative Entrepreneur's Guide to overcoming the obstacles that stop you before you get started. Don’t spend another year hitting the invisible wall between you and your dreams. We all have something meaningful that we want to do, something we are passionate about. Whether its a small thing like getting up early in the morning, or a big thing like starting a business. And whenever we set out to do anything that is meaningful to us, something stops us. It’s not that we don’t know how to do the thing, or that we don’t know the steps, or even that we don’t have the skills. Sometimes we have everything we need to successfully make a dream happen but we STILL don’t start. Why is that? INTERNAL OBSTACLES. There are things inside of us that keep us from doing what we really want to, despite our best efforts. A guide to overcoming the obstacles that stop you before you get started. Step 0 is full of tools that speak to your heart, not just your head, and will empower you to no longer be paralyzed and to actually do the things that you dream of doing. This book is targeted towards helping you uncover and process past the internal obstacles that are roadblocks to our progress and fulfillment. "I don’t even have the right words for this book… 'Incredible', 'Awesome', 'Insightful', 'Vulnerable', and 'Empowering' don't quite do it justice. This is GOLD. This is probably the best guide to starting I've seen from anyone, and I feel so honored to have read it. Nathanael is so freaking wise and helpful, and this book just flexed those muscles even further. People need this. I needed this. I found so much confirmation and so many healthy challenges on every page. After reading STEP 0, I felt incredibly empowered to take a hold of my decisions and actively pursue my life with more intention than ever. It put a fire in my bones and reignited the dreams tucked away inside me. Nathanael gives insight into some serious ways to overcome the battles of 'starting', and reminded me that LITTLE WINS MATTER, It IS possible to get my priorities straight with no valid excuses, and even when "writers-block" is at its strongest, I am stronger still. STEP 0 taught me that momentum is everything and the little things count. This is beautiful, so vulnerable, and so knowledge-filled; which completely matches who Nathanael is. I don't know who would be able to finish STEP 0 and not want to break a brick wall with their fist like a ninja warrior." Everything in this book comes from real-world experience and results, not theories or 3rd-party knowledge. These are the same principles, disciplines, and epiphanies that helped me write this very book; my very own STEP 0. If this knowledge can help me start a blog and complete a book within a year, it can help you with whatever your goal is. "It’s not often you find a person as talented and high in character as Nathanael Clanton. What makes him and his work so special is his authentic approach to the process. He never stops believing, never stops grinding, and will never stop dreaming. This book explains exactly the beliefs and foundational integrity that is found in every aspect of his life. If he wrote a book about wrangling slugs, I’d buy it, be inspired, and then end up the best slug wrangler the world has ever seen." A digital book for your digital lifestyle. Because STEP 0 is digital, you can take it with you wherever you go. You can read it on your phone, tablet, or laptop. It’s conveniently provided in ebook, PDF and audio formats for any of your devices. Introduction to the book and what STEP 0 means. Revealing the reasons you could be in your own way and breaking down how to dismantle each one. Even a legitimate excuse is still an excuse. Here’s how to transform them into an actionable plan. Don’t underestimate the power of little victories. – They are the stepping stones to progress when you feel paralyzed. When you're stuck, the key to accomplishing big things is momentum. Creating space to fully develop your ideas, rather than trying to move forward with fragmented thoughts. Redefining how you view your aspirations and expectations. Going from discouragement to empowerment. Taking big opportunities and bridging the gap between starting and success. 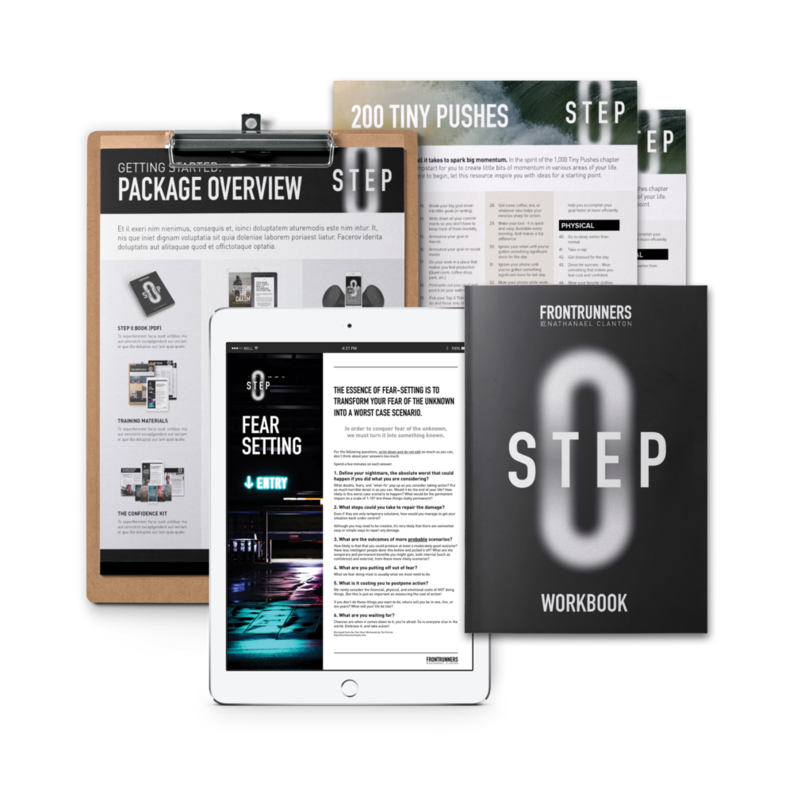 In addition to the STEP 0 book, you will be able to choose from 3 different packages, each containing different levels of awesome resources. These multimedia resources include a workbook, case studies, audio book, Advanced Training videos and video Masterclasses from successful people in all different fields: professional, creative, and personal, and more! These premium resources are specifically designed to amplify your progress through STEP 0 and to enrich and deepen the experience. And they are all in a digital format, so you can take them anywhere you go and use them at any time. "If you've had a dream or a vision, you've probably experienced the frustration of simply getting started. We can certainly relate. Nathanael does an excellent job untangling the fear and confusion that can plug up the process or stop it all-together. His thoughts and strategies in STEP 0 can help you get the ball rolling. Your idea could be amazing, maybe even life-changing! But it won't be anything if you never start!" Perfect for those who are just getting started. The Basic Edition meets you where you're at, whether you feel frozen, unsure of what your next step is, or just need a little boost to get rolling. I want Just the Book. For those who want a more in-depth process. Pro Tools - 76 of the top tools and services that the pros use to achieve their goals, grow their businesses, and expand their influence. Videos x3 - 1 Advanced Video Training & 2 Video Masterclasses with creative and business influencers including a razor-sharp music producer, and a breakout in the modeling industry. For those who want to go to the next level and learn from the best. Case Studies x5 - Stories and key principles of acclaimed Entrepreneurs, Creatives, Olympians, and Influencers who each overcame their own obstacles to achieve success. The Confidence Kit - A set of 4 resources specifically designed to empower you to build the confidence needed in key areas of personal development, creativity and business. Videos x7 - 2 Advanced Video Trainings & 5 Video Masterclasses with creative and business influencers, including Africa's Top Instagrammer millionaire business leaders, video & music producers, and a breakout in the modeling industry. Who Is Step 0 For? While STEP 0 is specifically designed for creative entrepreneurs, it's also VERSATILE. IT CAN WORK FOR ANYONE WITH ANY TYPE OF GOAL. Are you passionate about personal development but keep hitting a wall in your growth? Are you an entrepreneur who is afraid to take the plunge of making your idea a reality? Are you a regular person just trying to start something simple that feels super hard, like working out, eating right, reading more, asking somebody out, learning an instrument, or changing a habit? Are you a creative person who can’t bring yourself to put pencil to paper, or feel too intimidated to share your work with other people? Are you a business owner who is afraid to ask new people to buy what you’re selling? Are you a freelancer who is afraid to charge what you're actually worth? Are you a dreamer who has a big vision, but no clue how to get there? "Nathanael has a way with words: he keeps them simple yet, in their essence, they carry meaning. Reading Nathanael’s book has left me encouraged, excited and inspired. Not only do the words hold truth but their ability to make you self reflect makes them an invaluable read that will challenge you internally." Imagine your dreams and passions like a tall skyscraper with many floors. If you’re on the ground floor, you’re at STEP 0. In order to get to the next level, you have to take the stairs: Step 1, Step 2, Step 3, etc. until you reach the first floor. Those steps represent growth, learning, and knowledge. This is when you reach a new level in life; you’ve graduated from thinking to doing. Once you reach the top of that first flight of stairs you’ll see that now you’re at a whole new STEP 0: in order to get to the second story, you’ve got to start a whole new set of stairs, a whole new set of experiences that will take you to the next level. Life is made up of a series of STEP 0’s. And the key to continued growth and fulfillment is learning how to get off of each STEP 0 and to take the first step upward. The principles in this book will help you do that, and they are relevant at any stage in life, whether you’re on the ground floor of your dream or the 99th floor. "I'm not going to lie, everything that Nathanael has to say about success always seems to resonate with my heart in a way that is easy for me to understand, and yet oddly empowers me to take action. His voice is genuine, and he isn't afraid to call out what is important. I believe that is because he truly cares." + What if the book doesn't relate to me? We each have a different path in life. STEP 0 can teach anyone how to start their unique journey. Whether you’re an entrepreneur, a dreamer, a creative, passionate about personal development, or a regular person just trying to accomplish something new, STEP 0 will give you the tools you need to step forward into the future that you’ve been trying to get to. The principles are universal, and the knowledge is versatile enough to work for anyone trying to go to the next level. + What if I don't have money to buy STEP 0. + What if I don't have time to read a book? We make time for what matters most. Dedicating time toward your passion shows that it is a priority to you, so does spending time on social media. We all have the same amount of time; what we choose to do with it determines our success. The book is formatted in a way that makes reading quick and smooth, and it is divided into chapters that are easily digestible. Think of this book as a series of small, delicious meals, rather than a big heavy feast. You’ll feel refreshed, energized, and furled to take action, rather than weighed down and bloated. + I haven't read a book since high school. What if it doesn't hold my attention? I designed this book with people who don’t like reading in mind. The book is beautifully designed, with big images and typography. It feels more like reading a high-end magazine than a book. Each page is full of big headers, quotes, and captivating wording that will draw you forward to the next, making reading a really enjoyable experience rather than a task. + Books take too long to read. What if I can't finish? This book is condensed and focused. It’s not full of flowery language that trails you on before finally revealing the secret after 20 chapters. At around 160 pages, STEP 0 has all the value of a 300 page book in half the length. And because they each have a specific focus, each chapter provides you with a complete lesson, so you don’t have to read till Chapter 3 to get the payoff from Chapter 1. + I don't need a book to help me. I can accomplish my dream by myself. You came to this page for a reason. You’ve got something you’d like to accomplish, and what you’re doing isn’t quite working. You need something more. You need help. No one is “Self-made”; even the most famous people out there got where they did because of the influence and help of others. "STEP 0 is exactly everything I needed to read in this season of life. I've got a lot of things I need to prepare and plan for and get underway, and every word of this book added another log on to the fire. I'm super pumped to begin, NOW! – I’m so thankful for the wisdom Nathanael pours out through his writing; I know it's going to impact an incredible amount of people's lives." I wholeheartedly believe in the transformation you will experience as a result of going through STEP 0, but I want you to feel confident in trying it out for yourself as well! That’s why I have a 100% Risk-Free Guarantee. You can try STEP 0, and if you aren’t satisfied, just ask for a full refund no later than 14 days after your purchase date, no questions asked. To read the full refund policy, click here. NATHANAEL CLANTON IS AN ENTREPRENEUR, AUTHOR, BLOGGER, CREATIVE DIRECTOR, SPEAKER, AND BRAND CONSULTANT. More than a decade as an entrepreneur in the design industry working with globally influential brands like Nike, Brand Jordan, Microsoft, Xbox, Swingman (Ken Griffey Jr.), Windows Phone, ASICS, Apple, and GAP has made it his passion to act as a translator for vision, and helped him develop a process for intentionally designing a balanced and fulfilling life. He has worked with companies of every size, from launching startups to overseeing the brands of multi-billion dollar corporate clients. HE HAS A HUGE PASSION FOR CONNECTING WITH PEOPLE AND HELPING THEM DISCOVER THEIR PERSONAL CREATIVITY AND THE PATH TOWARD THEIR DREAMS; WHICH HE DOES THROUGH WRITING, SPEAKING, MENTORING, AND GENUINE RELATIONSHIPS. A teacher at heart, Nathanael believes that being transparent with others is the foundation for trust. He cares deeply about showing people their value and teaching them to stand up for it. He also loves helping people uncover their hidden dreams and saving them time on their journey by sharing lessons he's learned through experience. 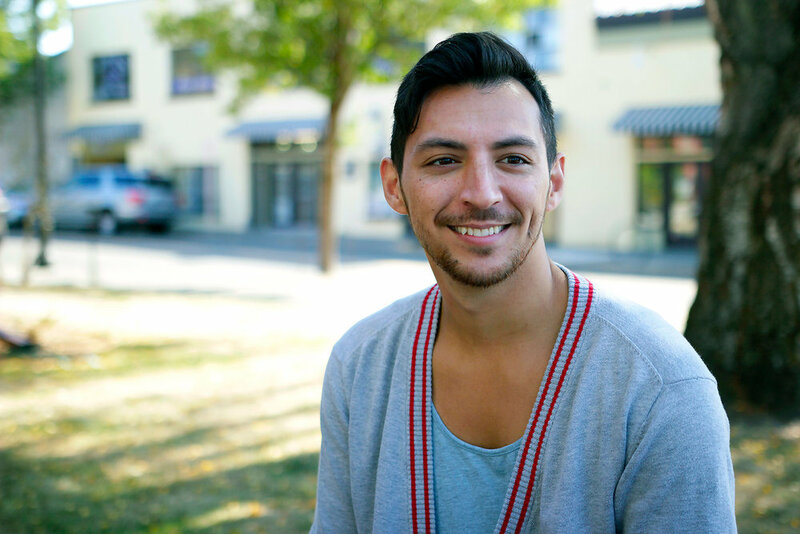 Nathanael lives in Portland, Oregon with his wife, best friend, and business partner Shannon, an accomplished photographer, stylist and blogger. They spend their days creating side-by-side, cooking, adventuring, laughing, and being in love. He is a Believer, an optimist, a movie lover, a huge Lord Of The Rings and Star Wars nerd, and addicted to reading books and learning new things. Nathanael loves good design, and believes the best kind of design is a well-designed life, full of passion, laughter, and fulfillment. We don’t take action on what we know, we take action on what we BELIEVE. Knowledge is only power if you have the heart to use it. It doesn’t benefit you to know what to do if you don’t believe you can do it. You simply won’t take action unless you can remove the internal obstacles that keep you from believing in yourself. This book is focused on much more than fun tips and tactics to get you through a specific task, it’s focused on internal transformation: treating the source rather than the symptoms. The transformation that will happen as you apply STEP 0 in your own life will pay dividends for years to come. You're one step away from doing what you love. "I've always been fascinated with the way things work, the big whys and hows of life, and the mystery that a person can be their own self but not know who they are. You don't need to be in pursuit of a dream or working on a goal to benefit from Nathanael's insightful conversation. If you are any kind of creative person, Step 0 should be your next step on the road of self discovery." DON'T STOP BEFORE YOU EVEN GET STARTED.